German philologist and historian of literature; born at Landsberg in the Neumark, province of Brandenburg, March 20, 1800; died at Halle May 14, 1875. His father was a merchant who had been successful and prosperous, but who in Gottfried's childhood had a series of business reverses that left him in a position where he had to struggle for the bare necessities of life and with but little prospect for providing the boy with a liberal education. At this juncture when the lad was about nine years old, two well-to-do brothers of his father, living in St. Petersburg, arranged to provide the means for his schooling, and he was entered at the Joachimsthal Gymnasium, Berlin, where he remained six years, being admitted to the Berlin University in 1817. Here in the pursuit of his philological studies, to which he now especially applied himself, he had the good fortune to study under F. A. Wolf—though the latter wasalready in the declining years of his life—as well as under Böckh and Buttmann. He received his degree as doctor of philosophy on Oct. 30, 1822, and in the same year published his first work, "Eratosthenica," a collection of the widely scattered fragments of the early Alexandrian astronomer. In 1823 he became privat-docent in philology at his alma mater, and two years later was appointed associate professor. He received a call from Halle in 1829 to assume the position of full professorship in the university there, and that of director of the philological seminary. This call he accepted, and Halle was the sphere of his activity for the rest of his life. During the two years from 1841 to 1843 he officiated as prorector of the university, and in 1844 he was appointed chief librarian, the duties of which position he fulfilled in addition to his work of instruction—not in any perfunctory fashion, but by reorganizing the library of the university in a complete and systematic manner. From the very beginning of Bernhardy's professorial career he prosecuted his literary labors as well. During the first year of his advent to Halle, there appeared his "Wissenschaftliche Syntax der Griechischen Sprache." 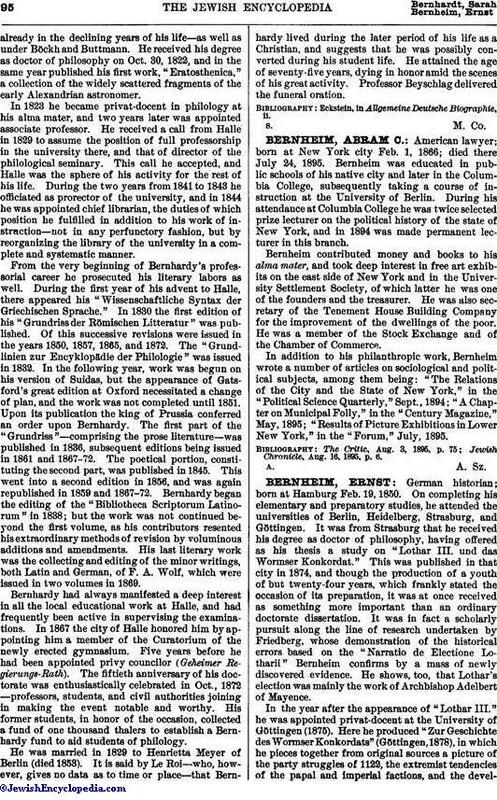 In 1830 the first edition of his "Grundriss der Römischen Litteratur" was published. Of this successive revisions were issued in the years 1850, 1857, 1865, and 1872. The "Grundlinien zur Encyklopädie der Philologie" was issued in 1832. In the following year, work was begun on his version of Suidas, but the appearance of Gatsford's great edition at Oxford necessitated a change of plan, and the work was not completed until 1851. Upon its publication the king of Prussia conferred an order upon Bernhardy. 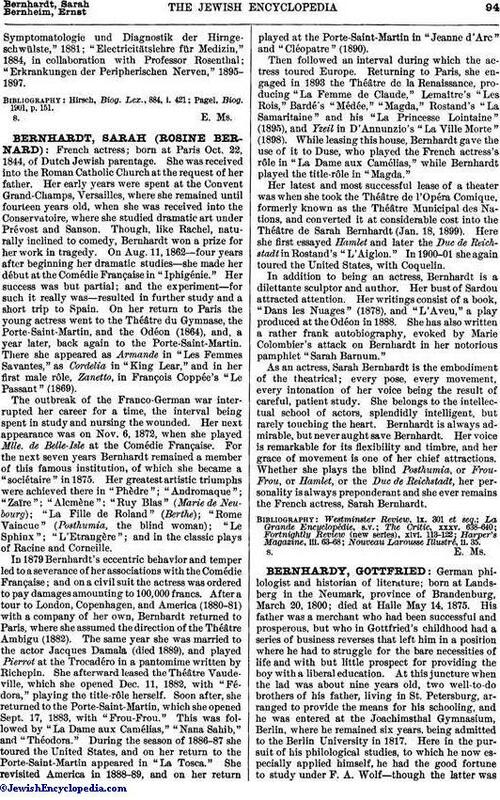 The first part of the "Grundriss"—comprising the prose literature—was published in 1836, subsequent editions being issued in 1861 and 1867-72. The poetical portion, constituting the second part, was published in 1845. This went into a second edition in 1856, and was again republished in 1859 and 1867-72. Bernhardy began the editing of the "Bibliotheca Scriptorum Latinorum" in 1838; but the work was not continued beyond the first volume, as his contributors resented his extraordinary methods of revision by voluminous additions and amendments. His last literary work was the collecting and editing of the minor writings, both Latin and German, of F. A. Wolf, which were issued in two volumes in 1869. Bernhardy had always manifested a deep interest in all the local educational work at Halle, and had frequently been active in supervising the examinations. In 1867 the city of Halle honored him by appointing him a member of the Curatorium of the newly erected gymnasium. Five years before he had been appointed privy councilor (Geheimer Regierungs-Rath). The fiftieth anniversary of his doctorate was enthusiastically celebrated in Oct., 1872—professors, students, and civil authorities joining in making the event notable and worthy. His former students, in honor of the occasion, collected a fund of one thousand thalers to establish a Bernhardy fund to aid students of philology. He was married in 1829 to Henrietta Meyer of Berlin (died 1853). It is said by Le Roi—who, however, gives no data as to time or place—that Bernhardy lived during the later period of his life as a Christian, and suggests that he was possibly converted during his student life. He attained the age of seventy-five years, dying in honor amid the scenes of his great activity. Professor Beyschlag delivered the funeral oration. Eckstein, in Allgemeine Deutsche Biographie, ii.